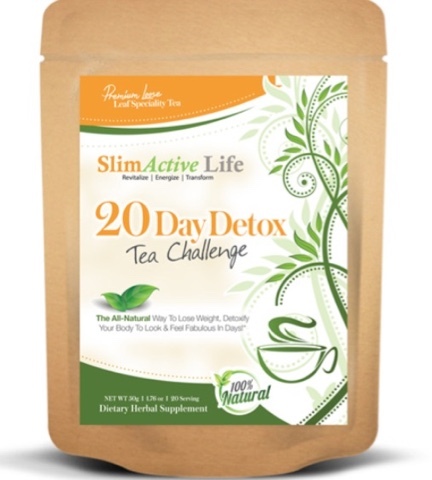 This tea contains 6 herbs that work together to "detox" your system and aid in weight loss. How? First, the tea helps by getting rid of bloat to shift excess water weight quickly. Second it gives you a slimmer waistline by targeting belly fat, thus slimming down the belly and getting rid of unwanted belly fat. Third, it helps you feel fuller between meals so you will eat less and appetite is controlled. It detoxes every organ in the body, even skin so it will lol radianto. Finally, it boosts vitality with vitamins, minerals and nutrients. 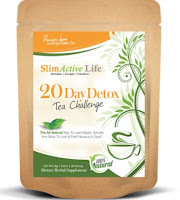 This tea promises change in 20 days, you will see a difference, guaranteed. If you are not satisfied with the taste, the product or the results they will give you your money back. It is a guarantee that they stand by this product. I noticed a difference in my appetite with this tea, not really a detox difference but I'm not sure what to notice there. The tea does help with appetite control though. It made me feel more full. This product sells on Amazon.com for $29.70: http://amzn.to/1Jl53V6.